Last Sunday’s meeting at Allensmore was a huge success given the Wimbledon and Euro 2016 Finals was live on television at the same time. 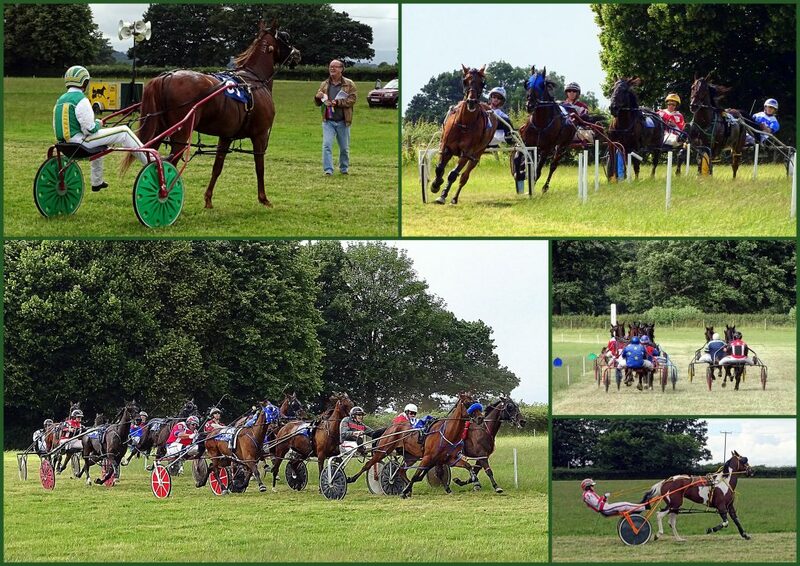 There was harness racing at Pikeall on the Saturday also. As always the organisers were mindful of putting on a varied and competitive card and it lived up to expectations. Congratulations to the team for the success and thanks for all the hard work they put in and the generous hospitality afforded to The Racing Horse. H&B HRC frame their second meeting of the season this Sunday 17th July 2016 at Allensmore and this time assembled a MAMMOTH 11-race card. Yet again the card is varied and competitive but also included are a heat of the Wales & West Pacing Series with £500 in prize money up for grabs. Looking at the card in detail it all looks very exciting and we urge the reader to support the meeting if possible. The Wales and West Pacing Series 2016 is kindly sponsored by Wellfield Stud and we thank them for all support. Apart from the main races which are due a 2pm start there are four qualifying races brimming full of genuine interest and these should not be missed. Those races are scheduled to start at 1pm before racing proper so our best advice is to get to Allensmore early. It will be fascinating to see how Tantalizing fares having another run back after her enforced break. We know she is gradually working her way back to form and fitness and is not being rushed by her trainer Stella Havard. In the same qualifier Robert Richards trials Wye Joels Best who is a 2yo bay colt and given the clever name it will fascinating to see what the owner/trainer has in his charge? In the second qualifier the 3yo bay filly Artemis runs for owner Elwyn Lloyd Jones and this one is a full sister to the grey Mattriach who has been doing so well recently. Has Artemis inherited the same genes, we will know a little more on Sunday? In the last qualifier the 2yo black filly Chinatown Beauty and the 2yo bay colt Manhattans Hotshot strut their stuff. The 5yo skewbald Hobbys Full Deck also take parts and will add to the visual entertainment. Also scheduled to run in this qualifier is the 3yo Cardigan Flash Man and a colt out of Doonbeg. After Race 6 there will be an Allensmore Junior Driver Pony Parade with Dylan Connors driving Top Girl and Theo Price driving Belle (pictured). Welcome to the second H&B HRC meeting at ALLENSMORE, courtesy of the Lawrence family. Today we’re proud to host a leg of the Wales & West Pacing Series as well as our usual races and GOOD LUCK ALL! Those of you who support us regularly will know that club members work their socks off to provide affordable and enjoyable racing for all concerned, which isn’t as easy as it sounds! This means that all officials here today are giving their valuable services free of charge, and that there are many unsung heroes behind the scenes, whom spend all year putting their hands in their own pockets at our fund raisers to make sure our race days happen. The bar and caterers share our belief that having a day out should not mean having to take out a mortgage, so please pop in and support them, you’ll be pleased you did. Enjoy your day and PLEASE CHEER FOR YOUR FAVOURITES – nothing pleases us more! And hopefully we will see you again here on Sunday 14th August 2016 and don’t forget Pembridge Show on 30th July 2016. If any reader has news or pertinence to the meetings then please send it to paulmoon@theracinghorse.co.uk so that we can include in the postings. Our intention is to raise awareness of harness racing in the region so welcome any help we can get. H&B HRC would like to thank everyone for their continued support at Allensmore. Good article, informative along with great action shots. We have very little media coverage these days. It is a great family day out, up close to the action. Thanks for comments. Love the horses and the local harness racing scene and just hope I can be of some help in getting the message out. Looking forward to Allensmore this Sunday, hope to see you there.